Behind the mask is a long-running– at 30+ years, in fact, the longest running– Broadway musical. In celebration of that milestone, which occurred for The Phantom of the Opera on this past January 26th, and for the benefit of Broadway Cares/Equity Fights AIDS, 30 well-loved designers are reinterpreting the iconic mask, originally designed for the production by Maria Björnson and realized by milliner Rodney Gordon. #PhantomFashion30 is a collaboration between the The Council of Fashion Designers of America and Bank of America and Phantom producer. Cameron Mackintosh. The #PhantomFashion30 designers include well-loved brands and names, such as Badgley Mischka, Chloe Gosselin, and Kenneth Cole. Also tackling the design challenge are Christian Roth, Dennis Basso, Edie Parker, Eugenia Kim, Gigi Burris, Ilesteva, Isabel and Ruben Toledo, Judith Leiber, Kendra Scott, Lizzie Fortunato, Marchesa, Naeem Khan, Nick Graham, Nicole Miller, Pamella Roland, Paul Marlow, Rebecca Minkoff, Sachin & Babi, Sally LaPointe, Stephen Dweck, Swarovski, Tadashi Shoji, Tanya Taylor, Title of Work, Vivienne Tam, Wolk Morais, and Zang Toi. The #PhantomFashion30 designs were revealed during an exclusive invite-only event sponsored by Bank of America on Tuesday, October 30. Beginning Wednesday, October 31, the thirty masks will then go on display at the Museum of the City of New York for 30 days. These one of a kind creations will be up for bids during a special on-line auction from the 30th of October through November 30th, with proceeds going to Broadway Cares. The Company in a London production performing “Masquerade.” Photo by Matthew Murphy. It is unrivaled, really, to have a show run for so long that it has gone well past its first generation. Longevity, of course, is not the only thing to recommend the longest-running musical melodrama on Broadway. 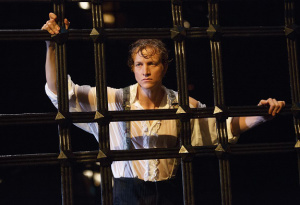 The Phantom of the Opera, still going strong after 30 years on Broadway at The Majestic, has a new leading anti-hero, the young Broadway veteran Ben Crawford. He will be donning the mask originally worn by Michael Crawford when the show opened in January 1988. and more recently by Norm Lewis and James Barbour. Crawford was last seen on the stage as Mr. Salt in Charlie and the Chocolate Factory. The 19th Raoul in the musical’s storied history on Broadway, Jay Armstrong Johnson will be joining the cast on April 30th. Johnson has appeared in the original Broadway casts of Hair (revival, in his Broadway debut), and Catch Me If You Can to name a few of his many theater credits. Johnson has also appeared in movies and television, including his leading role in ABC TV’s Quantico. Ben Crawford as the malevolent masked man and Jay Armstrong Johnson as the dashing Raoul, Vicomte de Chagny, join current principal cast members Ali Ewoldt as Christine, (with Kaley Ann Voorhees taking on the role at certain performances,) Laird Mackintosh as Monsieur André, Craig Bennett as Monsieur Firmin, Raquel Suarez Groen as Carlotta, Carlton Moe as Piangi, Maree Johnson as Madame Giry and Kara Klein as Meg Giry. To learn more about Andrew Lloyd Webber’s classic Phantom, and for tickets to the Broadway production (with links to its worldwide reach), please visit The Phantom‘s website. Scientology gets more dissing and distancing than Mormonism– well, except from Broadway’s The Book of Mormon. This long-running musical gives the Mormon Church a bit of a beating. In truth, we are afraid to disparage the beliefs of others, and religion is in general off-limits in polite company. Mormons are particularly lucky that this is so since the antics of the Church of the Latter Day Saints range from deplorable to laughable. For instance, it is appalling that they claim the ancestors of those in no way affiliated with their practice as their own. Their mythologies, like those of L. Ron Hubbard and his ilk, many of whom have chosen acting as their metiers, are over the top. Hubbard was a writer of science fiction, another arena, like the theater, in which a suspension of disbelief is helpful. Sorting out the Mormon backstory of their religion, and their history of the United States is a neat trick that boggles a logical mind. Your assignment, my pets, is to see the 1943 film of the same name as the long-running Broadway musical. The cinematic version is not strictly speaking a musical but it is full of melodies. Many a colorful opera is staged during the course of the movie. Nelson Eddy is Anatole, the baritone in love with the soprano Christine Dubois (Susanna Foster), who is also the object of adulation for Raoul (Edgar Barrier), the prefect of the Sécurité– in other words, a police captain. Leading trio celebrating the 29th year anniversary of New York’s longest running musical. Photo by Jeremy Daniel. She is also adored at a distance by a modest and timid older man, Erique Claudin, played by Claude Rains. Unlike Andrew Lloyd Webber’s Phantom, he is not a singer; he is the first violin in the Paris Opéra Orchestra. Like Broadway’s Phantom he is so obsessed with Christine that he will kill for her advancement. Along the way, this meek and odd little man collects some genuine and deep-seated grievances to warrant his unravelling as well. Claudin has a champion in the figure of Franz Liszt (Fritz Lieber) who admires the concerto the violinist submitted- without success- to a recalcitrant publisher, Pleyel (Miles Mander). None of this diverts Claudin from Christine. And, oh, do watch out for that chandelier! It is truly a musical, operatically filled with memorable lyrics and superb music. It is also so fantastical as to invite repeated visits to a theater near you. 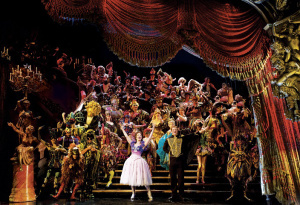 The production is the longest running Broadway musical, having hit its 29th year mark last January. The Phantom currently in residence is James Barbour, with Ali Ewoldt and Rachel Eskanazi-Gold alternating as Christine. Raoul, who is a Vicomte and not a policeman here, is played by Rodney Ingram. In the Lloyd Webber incantation, the Phantom is a singer with some of the most gorgeous songs to sing. He is a beautiful, evil-hearted beast. He is Christine Daaé’s Svengali and his melodies haunt as he haunts the Paris Opéra House. For tickets, please visit the #PhantomBroadway website, which will also guide you to the touring companies. Matilda, before it became a Broadway musical (since closed after a long run), was first a book then a movie. Roald Dahl won the 1988 Childrens Book Award for this novel of triumph over adversity. As with other Dahl stories for children, the protagonist is precocious and the plot is wry. The film of Matilda features Danny DeVito, who also directs, along with Rhea Perlman, Mara Wilson, Embeth Davidtz, and Pam Ferris. Now this inspiring family favorite returns to the big screen in stunning HD with Academy Award-nominated composer David Newman’s score played in sync by a full symphony orchestra. For the world premiere of Matilda Live in Concert, Newman will conduct the Houston Symphony on June 9th in Houston’s Cynthia Woods Mitchell Pavillon in The Woodlands.